Our homestudy arrived at USCIS yesterday! So the ticker has started counting down-hoping for mid-May. I feel like the loose ends are coming together and we will have everything ready to go when we get the i-171h. Seth and I are so excited for our friends, the Waals, who are adopting though our agency. They got a referral yesterday of two girls. Their wait time was a record breaking 5 weeks! I think my jaw actually dropped when I read their news. This is so exciting to see, and incredibly unexpected. Even more surprising because they are adopting two girls, they had expected boys--now they are a family with four daughters. Tracy may have to add a few more bathrooms to the house! I'm sure they are running around in a frenzy today. Watching the adoptions of our friends makes our adoption more of a reality. We are at a place now where I feel like we are caught in a wave and being swept along. 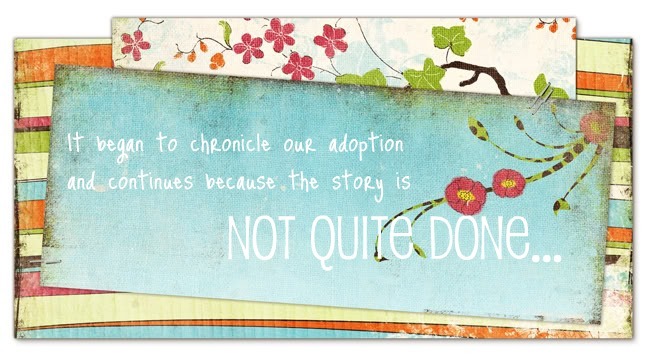 Yesterday our social worker called and had some questions before she finalized our adoption approval. We had mentioned adopting special needs, but had not gone into detail so she wrote our homestudy for two "healthy" children. Neither Seth nor I know what to do, we are adopting two kids, and that may be enough to keep us on our toes. I hate to make this decision flippantly and then wonder... As it is, I'm praying for two special kids in Ethiopia constantly throughout the day. I'm wondering if they are still with their family, if they are being cared for by loving people, if they have enough food to eat. I pray that we get there quickly to bring them home. We just got an email and our homestudy is DONE and on its way to USCIS. Hopefully we will get our 171 (approval for adopting internationally from US government) in three weeks. I'm guessing on this, time estimates are so fun irritating. Paperwork is slowly trickling in from various places around the country. We recently had a strange experience with the USPS. We have a document from our agency that has to be certified in Virginia. I mailed it to the Secretary of the Commonwealth over a month ago. Last week I received a letter from them, with all of my documents enclosed. I had inadvertently forgotten to enclose the payment! I honestly don't know how I manage! I recall putting the check in there..I think. In addition, the envelope had been burned on its way to VA. Not completely burned UP, but burned enough that we would need a new document from our agency. So weird, but stranger things have happened. Today I fed-exed the new documents, with a check to VA. I think their turn around is about 3 weeks also. Everything seems to be going smoothly, then these little hang ups come along. I know that God is in the hang-ups too though. He can see the whole picture and knows when we NEED to arrive in Ethiopia, so I'm trying to just trust that He will take care of paperwork. Whether He's expediting it or burning it! Trusting Him to do things perfectly and to control the adoption from beginning to finish is much easier. I got shots today for yellow fever and typhoid. I'm not up to a barrage of emails about immunizations (you know who you are). It's done, I'm innoculated against these critters and I'm still alive and functioning. Though my checkbook is short $150, thankfully Seth found out that he can get these vaccines though work for free. Unfortunately, he didn't decide to check into this until 7:30am today (we have had these appointments for 6 weeks). The gal at the health department was not pleased with his lackadaisical attitude about keeping his appointment. I told her to let me have it and I'd happily pass it along to my procrastinating spouse. At that point I thought I was getting a vaccine in my tush, and was very displeased that I didn't have him there for moral support. Alas, my sources are outdated and I didn't have to pull down my britches, just lift up my sleeves (sighs of relief). Today I hosted about 10 ladies for lunch at my house. It's through a Bible study that I attend, very low stress lunch-everyone brings their own lunches and we eat and talk about what is going on in our lives. Kids aren't invited, since we wouldn't be eating or talking if they were around. We would be chasing and rebuking. And lunch would go from one hour to three or four (I have personally experienced this). So I dropped my kids off at a friend's house and raced back home to ice the cake I made for dessert. Sidebar--I've never made a from-scratch cake in my life. I attempted this last night when I remembered the lunch date. I casually glanced into my pantry and I didn't have a single dessert mix in the house (usually I have a few brownie boxes for these sort of times). I did what comes naturally-called my mom. She started throwing ideas out of things to make, but I didn't have any cocoa-for some reason an ingredient in every dessert she recommended. She screams, "How do you NOT have cocoa? I think I've had the same tin of cocoa for years! You never run OUT of cocoa!" I realized that I could make a carrot cake and still make dinner in enough time to make it for church. I'd just zip into the corner grocery store on the way home and get a tub of icing. No biggie to ice the cake the next morning. Unfortunately, the store closed three minutes before we got there. So this morning, I went to the store on the way to Bible study, got my tub of icing, went to Bible study, THEN I dropped off my kids with my friend. As I'm icing the cake, the phone rings. It's my friend, the school just called and they needed her to bring a change of clothes because her son had spilled red applesauce all over his pants. She couldn't fit all the kids in the car, she needed me to come and get mine. When I got back to the house I shooed my kids into the yard, told them sternly not to come inside and gave them some lunch. Everyone is having a grand time. The kids are out on the deck snacking and the ladies and I are right inside the glass doors talking and eating. All is well, sort of, my cake is halfway iced and my kids keep peering into the glass doors, but I feel okay about how things are going. THEN one of my friends says, "Did your daughter pull her pants off?" I look outside and Ella is sitting on the deck facing us with Eli standing next to her. She looks clothed to me, but its hard to tell. As I'm standing up to further investigate she stands up too (probably realizing that she has drawn attention to herself). She's got her skirt around her ankles, and in an attempt to be modest she turns her back to all of us and bends over to pull up her skirt. Revealing her 'whatnots' to all of us eating inside. The first thing that Eli says when I got out there, "I told Ella she could pee outside, but I asked if she peed out of her bottom. So I told her to sit on the deck and hang her bottom off to pee. She might get a splinter on her bottom though." I shrill," Gracious! I'm not worried about splinters! Go inside and use the bathroom!" Many things are zippng through my mind, one of them being how to explain to my four year old that girls don't pee out of their 'bottoms'. Not an appropriate time for that discussion though. Also make note to mention to the kids that though boys can easily pee outside it is not okay to do that while a bathroom is easily accessible. Thankfully everyone got a good laugh out of it, and my kids showed me that they really will go to great lengths to obey me. I guess I should be more specific next time. By the way, that cake was absolutely, positively worth all the trouble! One of the things I find myself doing right now is timeline guessing. I have various scenarios going through my mind for referral dates and travel dates. I just got news from our social worker that she hopes to have the rough draft of our homestudy done this evening. That set off a series of "What ifs.." IF we get our rough draft tonight, then our final done by the end of the week, we could have it in the mail to INS next week. If they take three weeks to process, then that means our dossier will be done mid-May. 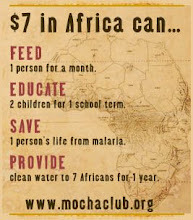 Give it a week or so in DC, then off to Ethiopia. We just got an update from our family coordinator (aka agency helper) stating that the past two referrals have been very fast (last one was 9 weeks), but the agency expects that most of us will still wait 3-7 months for a referral. Soooo, that means we would be waiting for a referral until August or (latest) December. After the referral we have to wait for a court date--hopefully a few weeks later but it could be 6 weeks, could be much more. Then we would travel. So, best case we travel in the fall to bring home the kids, worst case we travel in the spring. This latest hobby is an obvious waste of time. Without even putting any thought into it anyone could say, "Well, I'd imagine you would travel anywhere from fall to spring." I'd give that person a look, shake my head and walk away thinking, "What do you know?" I'm not planning on waiting until spring to bring those kids home. I'm planning on having five kids screaming down my stairs on Christmas morning, so I better bring two home before then! Which means that my social worker needs to get the homestudy done and INS has to process quickly, nothing slips through cracks and all arrives safely in Ethiopia. I feel my mind getting cranked up and whirring at the endless possibilities. I'm also completely disregarding God's plan. He could be planning for us to go very quickly or wait until next spring. After all the mind whirring, I have come full circle. I know what I need to do and can focus on that. I pray about the timing of this adoption, knowing all too well that God has these children already chosen for our family. I'm praying that they are still with family, they are well cared for and being loved. I'm trying awfully hard to trust God with the timing, but I still find myself asking for this to go quickly. I'm terribly impatient when it comes to paperwork, agencies, and the government. A friend of mine once told me that she doesn't ever ask God for patience, since she's afraid of what it may take for her to learn the lesson. She asks God, instead, to let her learn patience from watching the trials of others. We laughed at the time, but it seems to have a little truth to it. I'm praying that I don't need a lesson in patience right now. If you have 5 minutes, you may want to watch this moving video and the post that precedes it. This family has had a horrible experience with their agency, and it has taken them nearly two years to bring home their children from Ethiopia. Be careful though, it made me well up with tears, so grab some tissues! Heather does an amazing job of explaining the true meaning of Easter, and her video shows how God worked in their lives through this adoption. I decided to stay up late (late for me isn't late for you, so hold the scoffing) on Tuesday night and watch PBS. I wake up at 5 am to catch a glimpse of Seth before he heads to work, then I get a few hours alone before the troops join me for breakfast. When Seth pattered to bed and I followed him, I yearned for sleep, and had that feeling behind my eyes knowing if I dared to even sit on the bed I'd probably fall asleep. I also had a sixth sense that if I stayed up I'd probably hear cries in the night from any or all of my kids. They seem to have a sixth sense also and only wake me up when I really need to sleep. I pushed this out of my mind, bade Seth sweet dreams and went downstairs. Why would I choose to forgo an hour and a half of sweet sleep, to watch PBS? I had read (here) about a documentary called Black Gold that aired Tuesday night. The documentary explains the unfair trade practices in regards to Ethiopian coffee. Coffee and Ethiopia are two important things in my life right now. How could I not stay up and watch? So far I've read a bit about the difficulty that Ethiopian coffee farmers are having with Starbucks. I am not well informed to say the least. I'm up to my armpits in homeschooling, house projects, sick kids, adoption paperwork, new prosthetic leg acquisition, and life in general. This leaves enough time for me to grab a few minutes in the morning to update this blog occasionally, email a few friends and then get down to business with the previously mentioned matters. When I was presented with the option of watching a film dedicated to this issue, I figured that I better take advantage. I was thrilled with the information and sickened by the contrasts that they presented. These farmers are struggling to feed their families and then they show a blurb showing the excesses of the developed nations that are buying the coffee. Several times through the show I was moved to tears. It seems so hopeless, for these farmers to try and take on Starbucks, Nestle, Kraft… but in all honestly, it's a matter of life and death for them. I can't express how strongly I felt about some of the sentiments in the film. The effects of greedy businesses are far reaching. I sat and thought about the children who are in an orphanage now due to poverty. If the Ethiopian farmers were paid a fair wage for their work, would some of those kids still be at home? I haven't paid much attention to who I bought coffee from. Now my eyes are open to what struggles exist for me to enjoy my cup o' joe every morning. I will support companies that buy fair trade coffee and encourage you to reach into your deep pockets and do it too! Incidentally, all three of my kids woke up that night. Seth and I decided that it was possibly a night for records as each child woke us up a few times. Neither of us could remember a time that has ever happened. Morning came early, and the coffee mug was there to greet me, but my coffee didn’t taste quite as good as it used to. I just got mail! It's my certified birth certificate. I was a little worried, since I had to order it out of state. It is the first piece of paper that is completely done, RFD (ready for dossier). Things are coming together though! We have our last meeting with our social worker tonight, within the week our homestudy is going to be done! Could we possibly hope to have our paperwork done before May? Not a record setting pace, but I'd settle for that. This has to be the most bizarre weather, according to my six year old. He told me last week that snow in April is the most crazy thing that has ever happened in the world. His experience with April is quite limited, considering the first 5 years of his life were in Southern Alabama. So, it was not surprising after a week of flurries to wake up Sunday to snow. No riverside sunrise service for us, but I did remember to get a family photo. This gem will complete the photo pages for our dossier. And I won't tell you how many shots it took to get this, but most were *off* because Everett decided "Hot Dog" would be more appropriate than "cheese". The five pictures that were taken after his grand epiphany show three kids with theirs mouths in big "O" shapes. Funny, but (as Eli would say) "definitely not appropriate."